After spending years in the U.S. acquiring an MBA and working at several tech companies, Inderpreet Wadhwa returned to his native India to build a solar power business. India is an emerging market for solar, and many residents have no access to electricity and blackouts can be common. Now his company, Azure Power, will be building one of India’s first megawatt-scale rooftop solar projects that will put solar panels on dozens of rooftops and share revenues from power sales with building owners. 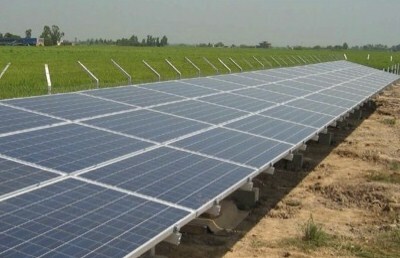 Up until now, Azure Power has been building ground-mounted solar power projects in India, in states such Gujarat and Punjab, where Azure built its first megawatt project in 2009. Since then, the company has completed or is building 56 MW of projects, Wadhwa said. An independent power producer, Azure engineers, builds and operates power projects to sell electricity to utilities. The company recently won a project from the Gujarat state government to build one of the two 2.5 MW rooftop projects. The projects are part of Gandhinagar Photovoltaic Rooftop Programme, which means it will start in the city of Gandhinagar, the capital of Gujarat, and expand to other parts of the state later. Gujarat has been teeming with solar power development thanks to its solar incentive program, and it recently celebrated the commissioning of 600 MW of solar power plants. About 25 percent of India’s residents have no access to electricity, according to the International Energy Agency’s “World Energy Outlook 2011.” That means 288.8 million residents don’t get to turn on the lights at night. About 80 percent of India’s electricity comes from power plants that burn fossil fuels such as coal and natural gas, according to the U.S. Energy Information Administration. As Katie Fehrenbacher found out during her trip to India last year, blackouts are fairly common even in modern areas of the country. Azure plans to install silicon solar panels on over 60 rooftops – 2MW on government and commercial buildings and 0.5 MW on residential ones – and complete the project by March 2013. Torrent Power, a private utility, will buy power from Azure at 11.21 rupees per kilowatt-hour for 25 years. Azure, in turn, will pass on 3 rupees per kilowatt-hour to rooftop owners, Wadhwa said. The national average for wholesale electricity from conventional sources is around 2-3 rupees per kilowatt-hour and about twice of that for the retail price, he added. Azure has lined up money for the rooftop project, though Wadhwa declined to disclose how much or who the investors are. The company has gotten financial support from organizations such as the Export-Import Bank of the United States and International Finance Corp. (IFC), part of the World Bank. Export-Import Bank approved a $16 million loan to Azure last year for buying solar panels from First Solar (s FSLR) and other equipment for a 5 MW project in the state of Rajasthan. IFC committed $10 million for two projects. Last year, the solar power producer raised €10 million ($13.6 million) in convertible debt from DEG, a member of the KfW state banking group. The bank would convert the debt to equity, but it didn’t say what stake it would hold in Azure. Azure raised an undisclosed A round from Foundation Capital and Helion Venture Partners in 2008. The foray into rooftop solar will afford Azure some lessons about aggregating small installations into a portfolio to attract investments and operating distributed solar projects. The company is interested in off-grid solar projects, but it has to figure out the right business model and mechanisms – such as prices and payment process – since the customers won’t be utilities but consumers themselves, Wadhwa said. A country has done something right, when her best and brightest return to genuinely make a difference. It’s sustainable and scalable (to borrow from the American India Foundation’s standards) and is a chance at making a genuine difference. Yes, I meant to say Torrent is a private utility. Fixed it. Thanks. Hwere do carbon credit fit in here?